Renewable energy is generated from natural resources such as the sun, wind, and water. Using renewable energy helps mitigate climate change, as it uses technology which ensures that the energy stores are naturally replenished. Renewable energy usage also reduces other environmental risks, such as harmful carbon dioxide emissions. Of the top 20 countries in the world where the use of renewable energy is highest as a proportion of total energy consumption, seven are Commonwealth countries, all in Africa, according to the latest annual data available from the World Bank. 89 per cent of Uganda’s energy consumption is from renewable sources, making it the highest ranked Commonwealth country. The Commonwealth average for renewable energy usage as a proportion of total energy consumption is also higher than the average for the rest of the world by 5 per cent. This indicates that on average Commonwealth countries are less reliant than the rest of the world on fossil fuel-based energy sources responsible for much of global warming and air pollution. CO2 emissions are one of the greatest contributors to the Greenhouse Effect and consequently to climate change. Carbon dioxide emissions are defined as those stemming from the burning of fossil fuels and the manufacture of cement. They include carbon dioxide produced during consumption of solid, liquid, and gas fuels and gas flaring. On average, CO2 emissions (metric tons per capita) for Commonwealth countries (3.93) is lower than that of the rest of the world (4.59). For 2014, the five countries with the highest CO2 emissions (metric tons per capita) included only one Commonwealth nation – Trinidad and Tobago (34.16). In 2014, the Commonwealth country with the lowest level of emissions was Rwanda (0.07). 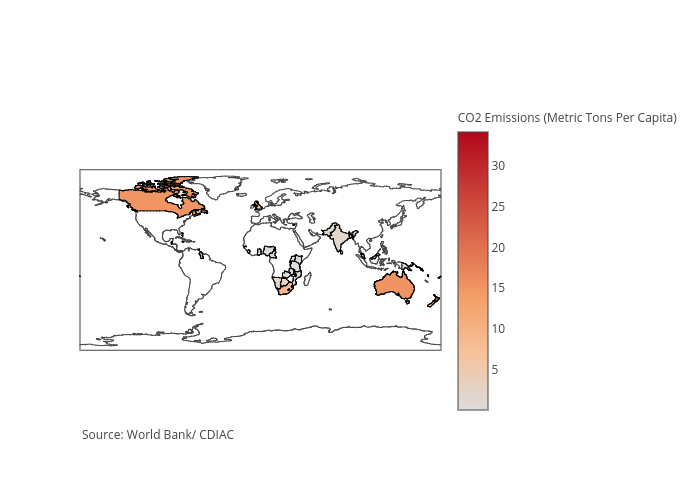 15 Commonwealth nations had CO2 emissions that were above the world average of 4.41.